What is a convection oven? How Does a Convection Oven Work? Convection ovens are ideal for those wanting to heat their food up quickly. While many people swear that conventional ovens are the way to go, there a plenty of reasons why a convection oven may be a better option. They are ideal for cooking large meals quickly and evenly, while maintaining their heat. You may have considered getting a convection oven, but aren’t sure what the fuss is about them. You may think they are like a conventional oven, but the truth is, they aren’t even close. While a conventional oven may be great for cooking certain items, a convection oven can surpass what a conventional oven can do. 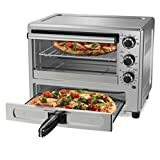 1 What is a Convection Oven? 2 How Does a Convection Oven Work? 5 What can be Cooked in a Convection Oven? 6 What Should not be Cooked in a Convection Oven? 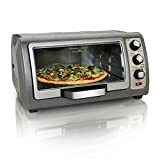 A convection oven is shaped like a conventional oven, but there is a fan in the back of the oven. This fan helps circulate hot air around the oven to cook your food. The hot air blown over, around, and even through the food helps it cook evenly. When the hot air circulates, it is thrown into the exhaust system that pulls out the hot air. It’s ideal for sealing in the flavor of meats, heating large portions of food at the same time, and it fits inside of a kitchen easily. Even though it has the same structure as a conventional oven, the insides of the oven and the heating system are completely different. Modern convection ovens are very versatile and affordable. 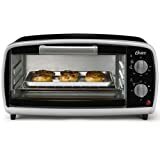 For example, you can pay less than $100 to get Oyama TRO-110C Turbo Convection Oven. This oven is one of the best convection ovens under $100. 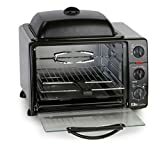 It allows you to roast, broil, grill, steam and bake your favorite foods. You can pay more to get a more versatile convection oven. 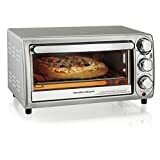 Breville BOV845BSS Smart Oven Pro comes with 10 cooking functions including a slow cook function. The reason why a convection oven works faster than a conventional oven is the amount of pressure being applied to the food by the hot air. When your food is in a conventional oven, the hot air just sits, allowing your food to bake. When you put circulation into the mix, the friction of the hot air allows your food to cook faster, and more thoroughly. When the hot air is circulating, and the used air is transported out, it allows for more heat to be introduced to your food. You can put something in a conventional oven, but you will need a higher temperature inside for a longer time than you need with a convection oven. There are many reasons why you should use a convection oven. When the air is moving around inside the oven, it has a chance to heat your food faster. The hot air can pass around the food, instead of surrounding it with hot air. Generally, food can cook up to 25 percent faster inside a convection oven, compared to a conventional oven. Read How do You Bake in a Convection Oven for tips to adjust time and temperature when baking with a convection oven. A conventional oven is great for baking, but when it comes to other foods, the hot air surrounds and sits. This can cause your food to have cold spots in different areas, depending on the location of the heating elements. Your food will be evenly cooked, thanks to the moving air. As the hot air moves around, moisture doesn’t have a chance to build up, like it would in a conventional oven. A convection oven can caramelize sugars better, giving meats a crust while keeping the moisture inside of the meat. The browning effect can make your food taste better. As people are concerned about their heating and electricity bills, convection ovens are an excellent way to lower your bills. They operate at a lower temperature, making it more energy efficient. There are a few types of convection ovens available. This has a fan on the back of the oven to circulate the hot air. The air is pre-heated, and sent through the oven and back out. A true convection oven has a heating element installed behind the fan. It distributes heated air instead of preheated air. This style produces better cooking results than a regular convection oven. There are two fans inside the oven, and they’re located opposite of one another. They can rotate at the same time, or be altered to maximize the quality of the heated air. The fans can be adjusted for different foods and temperatures. What can be Cooked in a Convection Oven? Roasted meats and vegetables are ideal for cooking in a convection oven due to the quick timing. Fat is melted quickly, and creates steam, which helps them cook faster. You can place a slab of cookies inside, and let it go to work. A convection oven is ideal for drying out meat, which can help you make excellent jerky. What Should not be Cooked in a Convection Oven? The delicacy of these foods need time to cook. Like with custards and flan, soufflés need time to cook. A convection oven won’t allow the yeast to rise. The interior of the bread can become dry. Even though a convection oven is ideal for browning, your bread will be more like a crouton if it’s put into a convection oven.